Happy Thanksgiving from our healthy kitchen to yours! 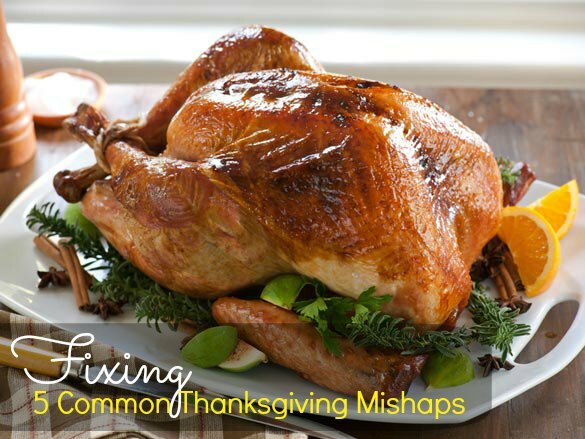 Hopefully your turkey cookin’ is going according to plan, but just in case it’s not, we’ve got five easy ways to overcome super common Thanksgiving Day mistakes, courtesy of FoodNetwork.com. From having surprise guests to lumpy potatoes, these tips can help save the day! 1. Unexpected guests show up: Have an extra turkey breast on had. Aunt Sally brought along her new boyfriend and his three brothers? No problem. You’ve already prepared for this by buying a boneless turkey breast. A 2 1/2-pound boneless breast only takes around 1 1/2 hours to cook. After it’s sliced up and added to the serving platter, no one will be the wiser. And if you don’t end up using it, freeze it for the next time you get a turkey craving. 2. My potatoes are lumpy: Cook a little longer. Lumpy mashed potatoes generally mean undercooked potatoes. If you get to this point and you realize you’ve undercooked your potatoes, just add a little bit of milk or cream and cook the potatoes over a low heat until the lumps begin to soften. Next time, make sure you cook the potatoes fully by inserting a fork into them before taking them off the heat. If the fork slips in easily, they’re done.